Computing for Compassion (C4C) serves compassion-based ministries through the appropriate application of computing solutions. Such solutions seek to magnify the capabilities of such ministries by solving their most frustrating problems. C4C provides students with an opportunity to apply their technical skills to such mission work, gaining real-world experience along the way. “My work with Computing for Compassion has helped me realize I want to be on the people side of technology," said James Payne, computer science major. C4C currently has more than 20 students working on projects. The group consists of mostly computer science majors, along with students in electrical and computer engineering, bioinformatics, mathematics and University Scholars. C4C is open to all students interested in using their technological skills to better the community. “Ministries in Waco and beyond should be able to focus on their mission, not get bogged down with technical challenges," said Jeff Donahoo, Ph.D., professor of computer science. 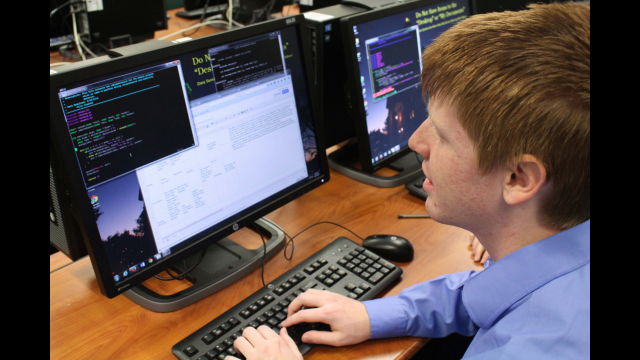 "Computing for Compassion allows students with skills in computer science and information technology to use their gifts to magnify the capabilities of compassion-based ministries. Our goal is simply to help enhance the great work of these programs." For more information on C4C or to submit a project for consideration, please email Dr. Jeff Donahoo or Dr. Bill Booth.